Available for new and existing customers, the Addictive Keys virtual instrument from XLN Audio is on the house when you register your controller keyboard. One full license per account gives you one Addictive Keys instrument. Pick from Modern Upright, Studio Grand, Electric Grand or Mark One. AUNCHKEY MINI MK2 Includes:. Launchkey Mini. Green Micro USB cable. Getting Started guide. Live Lite registration card. English and French safety information sheet. 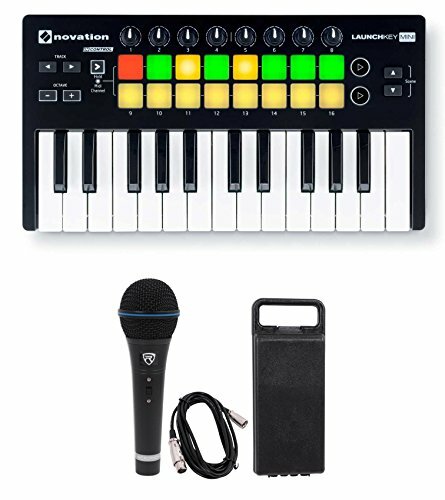 Novation LAUNCHKEY MINI MK2 25 Key USB Ableton Live Lite Keyboard Controller . Designed for Ableton Live- All the controls are laid out intuitively and work immediately. Trigger clips and play drums using 16 velocity-sensitive multi-colored pads. Dimensions: 3.07" x 14.96" x 8.66" (H x W x D). Unit Weight: 2.38lbs. System Requirements:. Mac OS X 10.10 Yosemite, Mac OS X 10.9 Mavericks. Windows 8.1, Windows 8, Windows 7. iOS 8, iOS 7 - Camera Connection Kit or Lightning to USB Camera Adapter required (not included). Software included upon registration:. Ableton Live Lite music making software. 4 GB of Loopmasters sounds and samples. Bass Station VST and AU plug-in synthesiser. RMM-XLR Includes: RMM-XLR 100% Metal wired mic. 10 foot XLR Mic Cable. Mic Clip. Plastic Carry Case. Owners manual. Rockville RMM-XLR Dynamic Microphone. Professional 10 FT XLR Cable Included. Steel Mesh Grill. On/Off Switch. Rugged Metal Construction. Natural Sound Reproduction. Beautiful Black Finish (The perfect combination of matte and shiny black finish). Frequency Response: 50Hz-15kHz.